Soup has always been pretty ‘meh’ to me. I use to think of it as one of those nonchalant foods which I could easily take or leave. Until…. I tried this! 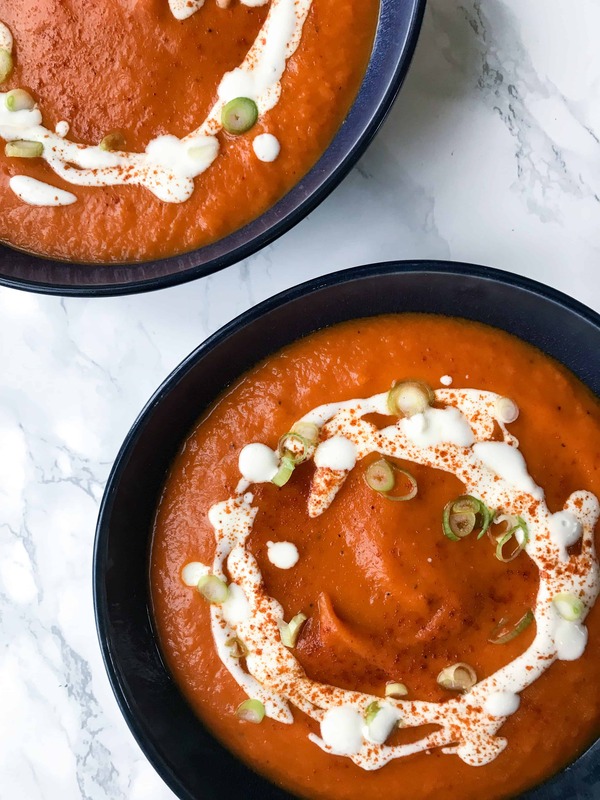 Roasted red pepper and sweet potato soup – it’s seriously good AND its actually filling enough to eat on its own. No. Bread. Needed. Whilst chatting to a friend the other day I was amazed when I heard that they made a big batch of soup on a Sunday night to last them for all their lunches throughout the rest of the week. I just thought BORING, who wants to eat soup everyday? But then after having a little think about it I realised how convenient this could be and how much time I could save having something prepared. So, I made it my mission to find a soup that was super yummy and that I actually wanted to eat. If you have an appetite as big as mine, you may understand that a bowl of watery liquid is NOT filling enough. I need substance. I need to feel as if I have actually eaten rather than just had a glass of water. I need carbs! So I decided to create something with sweet potato – because who doesn’t love sweet potato!? It is just so delightful and perfect in soup as it blends down really well. I had some left over red peppers in the fridge and *Lightbulb moment* red pepper and sweet potato soup!!! I thought I was a complete genius… until I looked it up online and realised it was a thing that had been done many, many times… but oh well. This is MY version and I think it is the best soup I have ever had. Hands down. Sweet potatoes are packed full of vitamin A (for healthy vision and skin), vitamin B1, B2, B3, B5 & B6 (convert food into energy), and due to the orange colour are also high in carotenoids (helps boost the immune system and protects against disease). Red peppers are a fantastic source of vitamin C (for growth and repair of muscle and tissue), vitamin A, B6 and folate (needed to make DNA and other genetic material). So as you can see this soup doesn’t just look impressive – it IS impressive! This soup is souper (pardon me) easy to make. It takes a little while to roast everything (totally worth it though! Everything tastes 100% better once roasted), but the prep is almost non-existent and once it is done, thats lunch for the rest of the week. Just deposit into Tupperware and throw in the microwave then you are feeling peckish. To make it look all fancy-schmancy for the pictures I added a little bit of yogurt to the top which worked well actually, but of course not at all necessary. 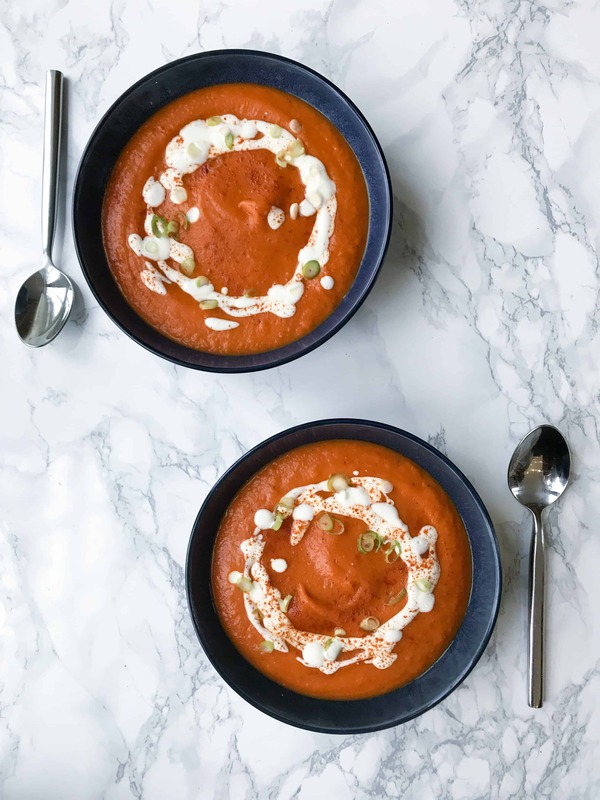 This roasted red pepper and sweet potato soup is a star all on its own. Try this out, take some pretty photos, tag me @georgieeatsblog and let me know what you think. I am officially a soup convert. A new woman!! Meh has turned into mehWOW….. Perfect to batch cook up for a quick weekday lunch. Filling and yummy, this sweet potato and red pepper soup is sure never to disappoint. Preheat the oven to 180°c fan/200°c/450°f. Peel the sweet potato and roughly chop into 2 inch chunks. Onto a large baking tray place the sweet potato and whole red peppers. Drizzle with the coconut oil and season with salt and pepper before using a spatula to make sure everything is evenly coated. Roast in the oven for 40-45 minutes until all the vegetables are soft and browned at the edges. Meanwhile, soften the onion and garlic in a saucepan with a little water over a medium heat for 5-7 minutes until translucent. Add the paprika and continue to cook for another 2 minutes before removing from the heat. 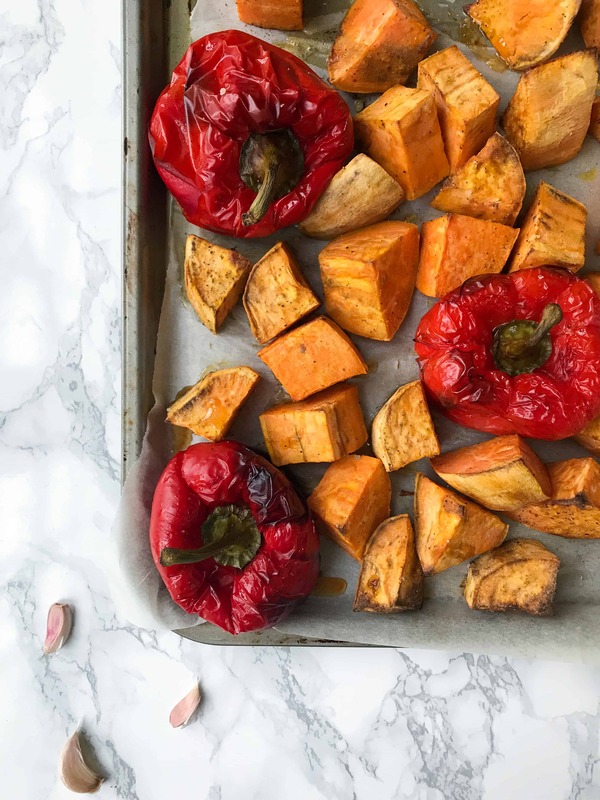 After removing the vegetables from the oven, allow the sweet potato and red peppers to cool for 15 minutes before peeling and deseeding the peppers. (This should be really easy if the peppers are soft enough). Transfer the onion mixture, veg and stock into a high-speed blender and blend until completely smooth. OR. Transfer the veg and stock into the pan with the onion mixture and using a handheld blender blend until completely smooth. Season to taste. Reheat over a medium heat until piping hot and serve immediately. OR. Allow to cool completely before transferring into airtight containers and storing in the fridge. Will keep in airtight containers in the fridge for up to 5 days. Depending on the size of your sweet potatoes and red peppers you may need less/more stock. Start off with 500ml and add more little by little until you reach your desired consistency. Always read the labels of your vegetable stock and make sure the ingredients are 100% natural without any added sugar. I recommend the 'Kallo Very Low Salt Organic Stock Cubes'.